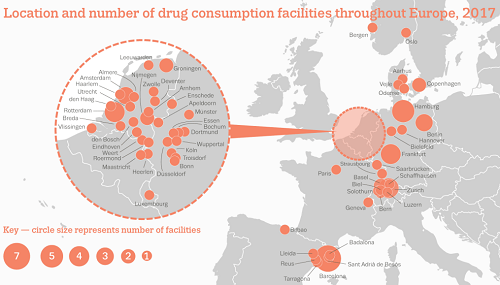 Luxembourg will open a safer drug consumption room (DCR) - the country's second - during the first quarter of 2019, the health minister has announced. The facility will open in Esch-sur-Alzette, a commune by the French border. Minister of Health, Étienne Schneider, said the location was chosen “because it is the most populated city in the south of the country and it already benefits from the presence of specialised services in the care of” people who use drugs. The government is also considering opening a DCR in the northern town of Ettelbruck, L'essentiel reports, but will first consult with the local population. The government "does not intend to impose the creation of a [DCR] against the will of the communal authorities," Schneider said. DCRs are harm reduction facilities which allow people to self-administer drugs in a safe and hygienic environment. They reduce disease transmission and risky injecting behaviour as all drug use takes place under the supervision of trained medical staff, and service users are provided with sterile equipment. The presence of staff also prevents deadly overdoses from taking place. The country's first DCR opened in the capital, Luxembourg City, in 2005. This facility offers counselling, on-site testing for HIV and Hepatitis C, and broader healthcare services aimed at reducing drug harms. The facility allows both the injecting and inhaling of drugs, and has had no fatal overdoses since it opened. The government have yet to announce if the facility in Esch-sur-Alzette will offer the same services. Alongside health benefits for service users, DCRs provide numerous benefits to wider society; they reduce drug litter and public intoxication, they reduce the spread of disease, they improve access to emergency services, and can reduce crime. DCRs are successfully operating in eight European countries, Canada, and Australia. This is the latest progressive drug policy move in the country. In June 2018, the country legalised medical cannabis, and in November, the government announced it would become the first EU country to legally regulate the drug for recreational purposes.